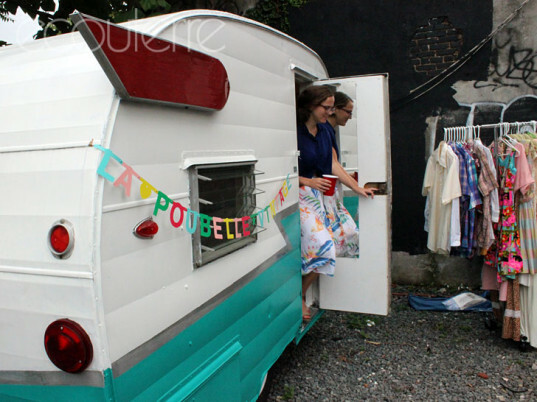 Though its name means "garbage can" in French, the treasures you'll find within La Poubelle vintage shop on wheels are anything but trashy. The brainchild of entrepreneur Laura Lanz-Frolio, the unique boutique is housed within a refurbished 1970s trailer that travels the streets of New York bringing a curated selection of retro-tastic '20s to '90s dresses, sunglasses, scarves, pants, shirts, shoes, and more to the people. Ecouterre recently caught up with Lanz-Frolio at the official La Poubelle launch party in Bedford-Stuyvesant in Brooklyn. Read on to see what she had to say about vintage shopping and find out where you can expect her to pop up next. What first attracted you to vintage and secondhand fashion? I loved the thrill of the hunt, and also finding things that no one else had. I was very into fashion growing up and I would troll the local thrift stores looking for interesting pieces. I started working at a proper vintage store while in college and that’s where I learned a lot and started to get into specific decades. In your opinion, is selling out of a mobile shop a considerable advantage over a traditional brick-and-mortar store? I think having the mobile shop is definitely an advantage. There are so many vintage stores in New York, so having a concept like this that is unique I think will set me apart as a business. Paying rent on a storefront in New York is also exorbitantly expensive, forcing store owners to drive up the prices of their vintage. I hate walking into a vintage store and seeing dresses for $300. Having the mobile shop, which is relatively low cost, allows me to keep prices reasonable. I also like that I can go to where the customers are, they don’t have to find me. I get to bring my shop to different parts of the city instead of staying in just one spot. Where did you get your trailer? How do you transport it from place to place? I bought the trailer from a guy I found on Craigslist in Maine. I tow it around with my car, a Ford Escape. Where and how can customers find you? I’ll be mostly parking around Brooklyn to start. I also have three dates booked at the Hester Street Fair (August 3, 17, 31) so people can find me there. 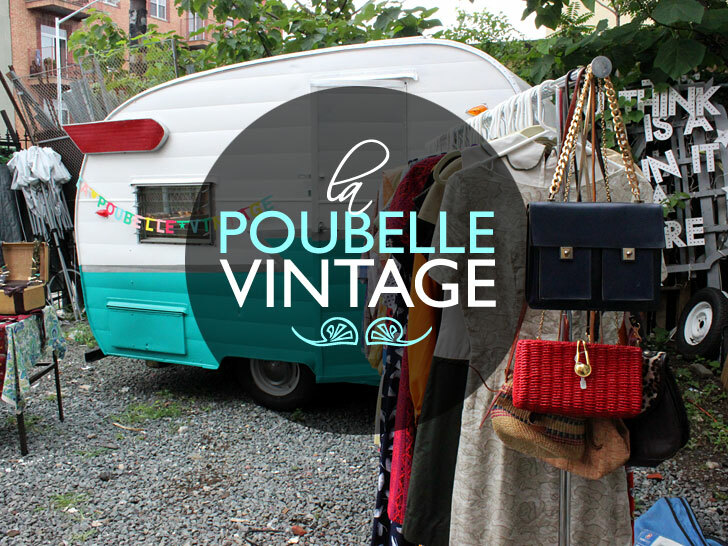 I’ll be posting my location daily on Twitter (@poubellevintage), Instagram (@lapoubellevintage), and Facebook (La Poubelle Vintage). What’s the hardest part of selling out of a mobile shop? The hardest part has been navigating parking and permits. Technically, no permit exists yet to sell merchandise out of a vehicle (such as a trailer) so mobile shops are really forging new ground in NYC. Of course, parking in the city is a pain so just finding a place to set up shop streetside will be a challenge! From what you’ve seen on the streets, do you think vintage and secondhand fashion are gaining popularity? Vintage is definitely gaining popularity. In NYC especially, where people are so into fashion, wearing vintage is the best way to stand out from the crowd and wear a really interesting and unique piece. Some people think vintage fashion is very expensive. What are your price points like? Like I mentioned before, overpriced vintage is one of my pet peeves. Having minimal operating costs allows me to keep my prices lower than your average vintage shop. That being said, a lot of work does go into selling vintage clothing, including sourcing, cleaning and mending items. These are all pieces with a lot of history which makes the price a bit higher. My prices go from $10 for small accessories (tie bars, cufflinks, scarves) up to $150 for more rare and older pieces. Most items are $30 to $65. What are your best tips for finding and wearing vintage pieces? I think the best way to wear vintage is to find really standout pieces to mix it in with your modern wardrobe. Sometimes head-to-toe vintage can look costumey so I like to pick one or two statement pieces-be that a dress with an awesome print, a chunky necklace, or a pair of high-waisted shorts-to pair with items that you already have and love. Lanz-Frolio says she gravitated toward vintage fashion because she loves the "thrill of the hunt." She also enjoyed finding things that no one else had. "I was very into fashion growing up and I would troll the local thrift stores looking for interesting pieces," she tells Ecouterre. In college, she found employment at a vintage boutique. "That's where I learned a lot and started to get into specific decades," she says. For Lanz-Frolio, a "fashion truck" differentiates her store in a saturated market. "There are so many vintage stores in New York, so having a concept like this that is unique I think will set me apart as a business," she says. Another plus? Lower operating costs. "Paying rent on a storefront in New York is also exorbitantly expensive, forcing store owners to drive up the prices of their vintage," she says. 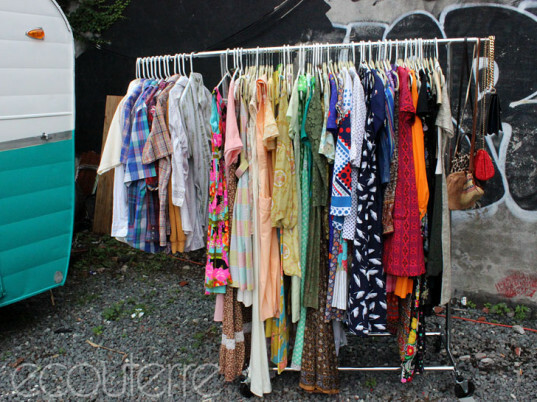 "I hate walking into a vintage store and seeing dresses for $300. Having the mobile shop, which is relatively low cost, allows me to keep prices reasonable." Lanz-Frolio also gets to go where her customers are, rather than wait for people to come to her. She tows her trailer, a Craiglist find, with her car, a Ford Escape. 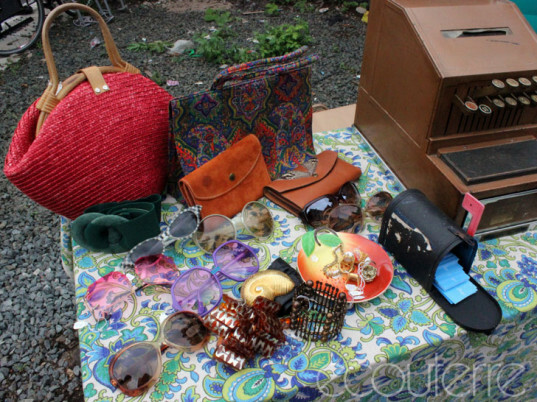 You'll find La Poubelle in Brooklyn for now, as well as at the Hester Street Fair on August 3, 17, and 31. Keeping tabs on the store is easy through social media. "I'll be posting my location daily on Twitter (@poubellevintage), Instagram (@lapoubellevintage), and Facebook (La Poubelle Vintage)," Lanz-Frolio says.